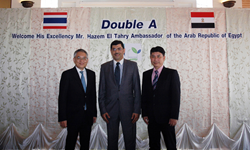 Double A has recently welcomed His Excellency Mr. Hazem El Tahry, the Ambassador of Egypt to Thailand to its pulp and paper mill in Prachinburi. His Excellency Mr. Hazem El Tahry (center), the Ambassador of Egypt to Thailand; Mr. Thirawit Leetavorn, Double A Senior Executive Vice President (left) and Mr. Phichej Wangtherdkiat, DAIN Co-CEO. His Excellency Mr. Hazem El Tahry, the Ambassador of Egypt to Thailand was welcomed by Mr. Thirawit Leetavorn, Double A’s Senior Executive Vice President and Mr. Phichej Wangtherdkiat, Double A International Network (DAIN) Co-CEO during his visit to Double A’s integrated pulp and paper mill in Prachinburi Province. ‘It is a great honor for Double A to welcome His Excellency to our facilities. His acceptance of our invitation is a proof that Double A’s efforts are in the right direction and a motivation to further our commitment for growth in the Egyptian market’, said Mr. Leetavorn.